Sorry, Italian Painted Commode is not currently available. An Italian neoclassical style painted two drawer commode raised on square tapering legs with arabesque decoration and reserved black and white panels of Asian figures. 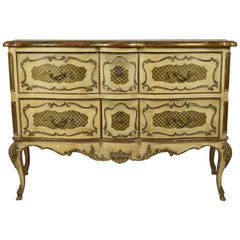 Six drawer antique Italian Rococo style painted commode. Interior has silk lining. Structurally sound. Paint has a nice patina. 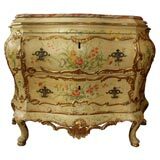 18th c Italian painted marble top commode with bombe form. Rectangular faux marble top over three drawers with floral decoration and cut paper birds, cast bronze handles, raised on cabriole legs. 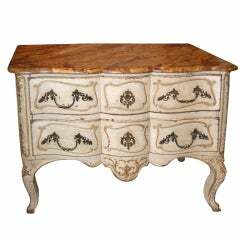 Large Italian 19 century hand painted neoclassical style marble top commode . Painted with classical busts and garlands .